Underdogs improve to 15-9 ATS in first round of NCAA Tournament. 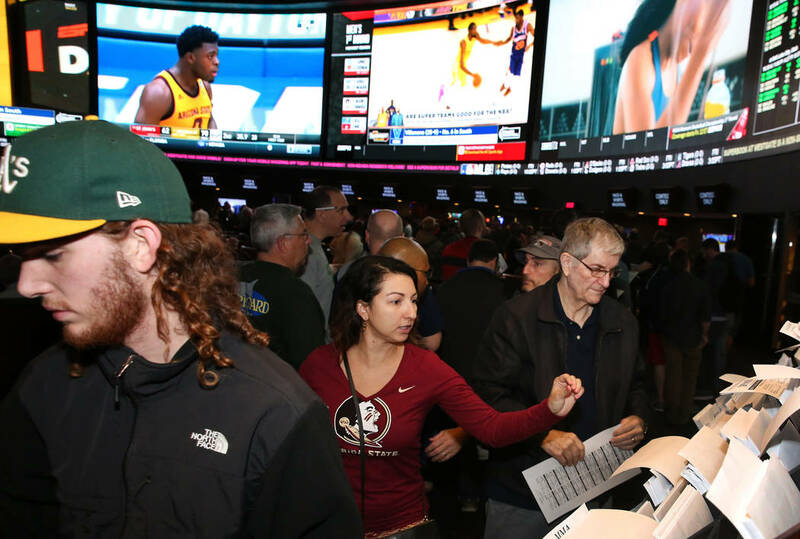 Las Vegas Review-Journal sports betting columnist Todd Dewey will be writing a live blog Friday on the second day of the NCAA Tournament from the Westgate sportsbook. Underdogs improved to 15-9 ATS in the first round after starting 6-2 ATS on Friday with four outright wins by No. 12 seed Oregon, No. 13 seed UC Irvine, No. 10 seed Iowa and No. 9 seed Oklahoma. The Ducks outscored the Badgers 47-29 in the second half for their ninth straight win and cover. Oregon opened as high as a 3-point underdog, swung to a 1-point favorite and closed as a 1½-point ‘dog. The same CG Technology bettor who placed a $500,000 money-line bet to win $27,777 on Michigan (-1800) Thursday rolled it over Friday for a $527,777 money-line wager to win $37,700 on Texas Tech (-1400). The high roller cleared a little more than $65,000 on more than $1 million in wagers. A William Hill bettor placed an $8,750 money-line wager to win $125 on Virginia, which trailed Gardner Webb by 14 in the first half before storming back for the victory. A Caesars Entertainment bettor placed a $150 money-line wager to win $1 on Duke (-15000) over North Dakota State. William Hill sportsbook director Nick Bogdanovich said large money-line wagers to win small sums are common. The Bulls built a 13-point lead and led by as many as 23 in the second half. The Raiders rallied from a 12-point halftime deficit to take a 52-50 lead midway through the second half and stayed close the rest of the way. The Cavaliers opened the second half on a 25-5 run and were on the verge of covering before Gardner-Webb scored the final six points. Pros and Joes alike were all over the Anteaters, who went on a late 14-2 run to take control and then held off the Wildcats for their 17th straight win. The loudest roars of the day were for UC Irvine, none more so than when Max Hazzard made a 3 to push its lead to five points with 1:29 left. The overflowing crowd at the Westgate rose up in anticipation as Northern Kentucky fired a 3-pointer at the buzzer that would’ve given Norse backers a backdoor cover. But the shot glanced off the rim as the Red Raiders escaped with a cover. The betting public was all over the Bearcats, driving the line up to 4½ after it opened at 3½. Cincinnati led 18-5 but Iowa broke open a close game with a late 18-5 run to give the books a big win. The crowd let out its loudest roar of the morning when Joe Wieskamp drained a 3 to put the Hawkeyes up 70-64 with 1:47 left. Bettors were all over Ole Miss but the Sooners sprinted to a 14-2 lead and led by 22 in the first half. The Rebels cut the deficit to 12 early in the second half but never got within single digits. 10:30 a.m. — A CG Technology bettor placed a $500,000 money-line wager to win $27,777 on Michigan (-1800) on Thursday night, but no notable bets have been reported on Friday’s games. The biggest decision for the books is on the Cincinnati-Iowa game, which tipped off first at 9:15 a.m. The public is all over the Bearcats, who closed as 4½-point favorites after the line opened at 3½. The Pros and the Joes are on UC Irvine, a 4-point underdog to Kansas State, which opened as a 5½-point favorite. William Hill sportsbook director Nick Bogdanovich said their two biggest needs are Iowa and Georgia State, a 12-point underdog to Houston. “They’re all over Houston,” he said. Caesars needs Oklahoma “for a ton” over Mississippi. The Sooners opened up a 21-point lead in the first half. 8:03 a.m. — Sixteen first-round games down Thursday, 16 to go on Friday as many visitors to Las Vegas will surely start their morning off with a coffee instead of a cocktail as day two of the NCAA Tournament comes quick. Underdogs went 9-7 ATS with four outright wins on day one, though favorites closed the day on a 6-2 cover run. Check back for updates throughout the day as we’ll recap every game through a betting lens and keep you posted on all the buzzer beaters, bad beats and more. There are 16 games Friday, starting with No. 10 Iowa vs. No. 7 Cincinnati (-4½) at 9:15 a.m. and No. 9 Oklahoma vs. No. 8 Mississippi (-1) at 9:40 a.m. The other morning matchups are No. 3 Texas Tech (-13) vs. No. 14 Northern Kentucky, No. 13 UC Irvine vs. No. 4 Kansas State (-4) at 11 a.m. and No. 15 Colgate vs. No. 2 Tennessee (-17½). Sharp bettors are on UC Irvine, Liberty, Virginia Tech, Iona and Central Florida. They’re also on Colgate in the first half.